The key to Onkyo's success is simple: its receivers are packed with the latest features and sound great, yet somehow its prices stay competitive. So it comes as no surprise to find the company, once again, applying this crowd-pleasing approach to the budget arena. The TX-SR308 is a 3D-ready 5.1-channel receiver, offering a claimed 100W per channel and decoding for Dolby TrueHD and DTS-HD Master Audio. Sockets are predictably thin on the ground, but at least there are three HDMI v1.4 inputs for your hi-def sources, all of which are primed and ready for 3D and the Audio Return Channel feature. They're backed up by three digital audio inputs and four sets of analogue inputs. Meanwhile, Onkyo's Universal Port lets you connect optional peripherals such as an iPod dock or DAB tuner. Only the front speakers get binding posts, though; the other channels must suffer the ignominy of springclip terminals, which isn't great if your cables are particularly fat. From the front, the look is of Onkyo's signature black, covered in lights and buttons. It's tasteful and nicely laid out, although there are no sockets besides a line input for MP3 players. Build quality is also impressive for the money. But given Onkyo's usual generosity I expected even more features, even at this low price point. 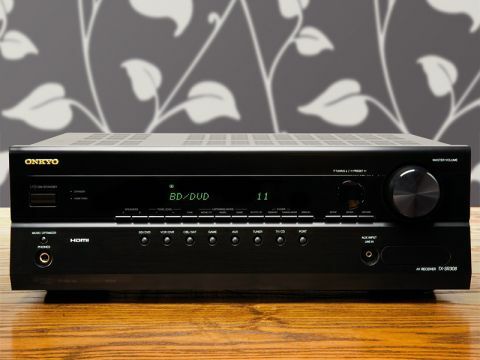 There's neither hide nor hair of Dolby Pro-Logic IIz, Audyssey processing or 1080p upscaling, but there are plenty of other sound modes to play with, including 11 Onkyo 'Original DSP' settings and vanilla Pro-Logic II. There's also no automatic calibration, so everything has to be tweaked manually using the setup menu. Thankfully, the company has designed an attractive onscreen menu, which is one of the clearest we've encountered, and puts a wealth of options at your disposal. Onto performance, and although the SR308 doesn't blow me away like the mid-range TX-SR608, it still does a terrific job with movie sonics. There's lovely harmony and cohesion between channels, while frantic effects during Avatar's Battle for Pandora are conveyed without eardrum-piercing hardness and delicate detail oozes from every speaker. Bass tones are also taut and nimble, providing a solid foundation to any scene. Encouraging, but it's not always the breathtaking home cinema experience I was hoping for. When it comes to huge blockbuster scenes that require a real sense of wall-shaking power and scale, the Onkyo is just too polite and restrained to do them justice.